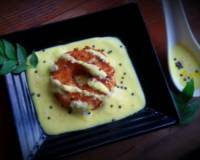 Achari Paneer Tikka, a delicious starter made with paneer marinated in a achari masala. 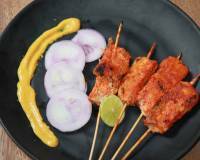 You can make Achari Paneer Tikka for house parties and can also serve along with your meals. 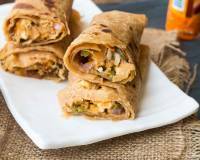 Achari Paneer Tikka is the most popular vegetarian appetizer in the Punjabi Cuisine. The word achar in Hindi means pickle. 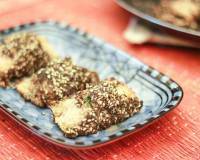 Paneer cubes marinated in an achari marinade makes an aromatic, flavorsome party snack. 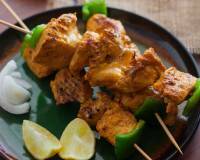 A blend of pickling spices goes into the marinade giving a distinctive flavor to the paneer. You can either grill the marinated paneer pieces on a grill pan over the gas, can use a charcoal barbecue or can do it in the microwave grill as well. Vegetables can be marinated in the spices and stored in an airtight box in the fridge a day before the party. Serve Achari Paneer Tikka along with other yummy dishes such as Chole Aloo Tikki Chaat and Pav Bhaji Pizza for your house parties. To begin making the Achari Paneer Tikka Recipe, firstly we will marinate the masala for Paneer. To prepare marinade for Achari Paneer Tikka, in a pan add mustard seeds, cumin seeds, fennel seeds, nigella seed, carom seeds, fenugreek seeds and dry red chilies. Dry roast the spices and chillies over medium heat till fragrant and slightly browned. Turn off the heat. Transfer spices to the jar of mixer and grind into a coarse powder. Transfer the achari tikka spice powder to a bowl. Keep aside until required. Pound the ginger and garlic using a Pestle & Mortar to make a paste and keep aside. 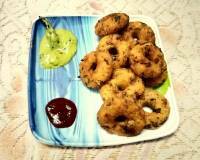 In a large bowl add the yogurt, ginger garlic paste, garam masala, salt to taste, lemon juice and the spice powder mix. Stir well to combine all the ingredients. Add the paneer cubes with capsicum pieces into the marinade. Stir well to coat the paneer pieces into the marinade. Cover the bowl with the lid and keep aside for 30 minutes. This process could be done one day before as well. Store the marinated paneer in an airtight box in the fridge. Cover the bowl with the lid and keep aside for 30 minutes. This process could be done one day before as well. 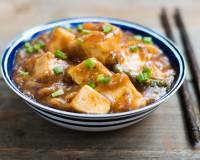 Store the marinated paneer in an airtight box in the fridge. Once the marination is done, our next step is to cook the Paneer Tikka's. There are two ways you can make these. If you have a Barbeque Grill then you can grill the Achari Paneer Tikka's or flavor the Tikkas using the Coal Smoking Method. To grilling the tikkas, we will first soak skewers in water for few minutes. This prevents skewers from falling apart while grilling. 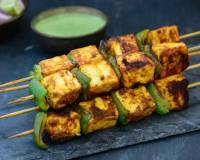 Thread the paneer pieces and capsicum into wooden skewers, arranging alternatively. Prepare your charcoal barbecue. Grill the Paneer Tikka skewers from both the sides applying little oil till they turn brown on all sides and charred marks appear on the paneer. Heat oil in a Wok (Kadai); add the marinated paneer tikka pieces and stir-fry for a few minutes on low to medium heat. In the meanwhile; prepare the coal for the coal smoking method. Once the coal reaches red hot, place the hot coal in small steel or glass bowl. Place this bowl in the center of the Kadai that has the Achari paneer tikka, pour a teaspoon of ghee. You will notice that the coal will begin to smoke. At this stage, cover the pan and allow the smoke flavors to get into the tikka. Keep it covered for about a minute. Open the pan and the tikkas will be ready to be served. Transfer grilled Achari paneer Tikkas to a serving plate. Serve Achari Paneer Tikka along with other yummy dishes such as Chole Aloo Tikki Chaat and Pav Bhaji Pizza for your house parties.